If you own any of Amazon's Android-powered devices, and you buy new apps or in-app purchases regularly, you might want to take advantage of the latest Coins promotion. Amazon is selling 10,000 of its self-branded credits (equivalent to $100 USD when buying apps) for just $75 today. If you spend at least some money every week in the Amazon Appstore, this should be a good deal that will cover you for quite a while. Smaller increments can be had at smaller discounts, but these are the usual bulk discounts for Coin purchases: 500 coins ($5) can be had for $4.80, 1000 ($10) for $9.50, 2500 ($25) for $23, and 5000 ($50) for $45. The 25% off promotion is "for a limited time only," but we don't know when it will end. At present it doesn't look like this discount is available outside of the US. 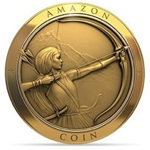 Remember, Amazon Coins can only be used in the Appstore - they're not good for other digital goods, like books or movies, and you can't apply them towards physical Amazon purchases. On the other hand, you don't have to be a Kindle Fire or Fire Phone owner to use them: anyone with the Appstore installed on their Android device can use the coins in their account to buy apps or in-app purchases. [Weekend Poll] The Google Now Launcher Is Now Available For Most Devices - Are You Using It?